NAUGATUCK — The sports fan is ingrained into society. Dealing with the perils of the thrill of victory and the agony of defeat is part of the country’s culture. Three Naugatuck friends — Pat Granahan, Rob Rager and Dave Walsh — grew up immersed in that culture. The three friends would spend countless hours together talking about sports, until one day they decided to start broadcasting their conversations. Where the three friends are now is hosting a weekly sports talk show — appropriately called 3 Guys Talking Sports — on internet radio. The show hits on a broad range of subjects, from the local Naugatuck sports scene to national topics. Walsh is also an avid hockey fan and Rager is not. Granahan, an account executive for Crystal Rock who also played baseball for the Greyhounds in high school, serves as the referee when Walsh and Rager get into highly intense debates about the sport. 3 Guys Talking Sports made its debut last December in the Sunday 10 a.m. to 1 p.m. time slot on PPRN Radio, Peter Pinho Radio Network, a podcast platform. The debut show recorded 300 plays and by the second show it was up to 469 plays. The show continued to gain momentum and listeners. By late spring the show’s creators decided to distribute the show independently. After a brief absence from the online radio waves, 3 Guys Talking Sports was back on July 10 via the Spreaker platform. The show is now broadcast on spreaker.com/3guystalkingsports and it offers podcasts via iTunes. Listeners are encouraged to join in on the conversation by calling 203-519-7881 on Sundays from 10 a.m. to 1 p.m. 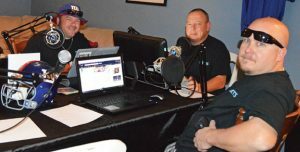 The show has picked up steam since the trio got back on the airwaves in a makeshift studio equipped with state-of-the-art technology at Rager’s house. Over the past few months, the show has secured several sponsors, including Mr. D’s Tavern, Cook’s Café, Moe’s Automotive and Wing It On Tap. Bolstered by the technical genius of Rager’s brother, Steve, a Bradford Hall student who serves as the co-producer and sound engineer, along with internet specialist Chris Main, the radio trio is reaching new heights. In August, they did an appearance for the New Britain Bees, a Minor League Baseball team, for a ticket giveaway promotion. They also booked former ESPN and CBS radio broadcaster Bob Sagendorf, a Naugatuck resident, to be a guest speaker for their Sept. 4 show. “They remind me a lot of Chris Berman and myself when we started,” Sagendorf said. “The challenge now is sustainability, and it’s a three-prong effect. They need to build their social media on multiple platforms. They need to incorporate local sponsors and they can’t get lazy. They need to keep up with their knowledge of what’s going on around them in the world of sports. The program is branching out. The show recently held its very first Thanksgiving preview episode and brought in Earl Stanley of Ansonia and Steve Croce of Naugatuck, two former football players, to talk about the oldest high school football rivalry in the state. 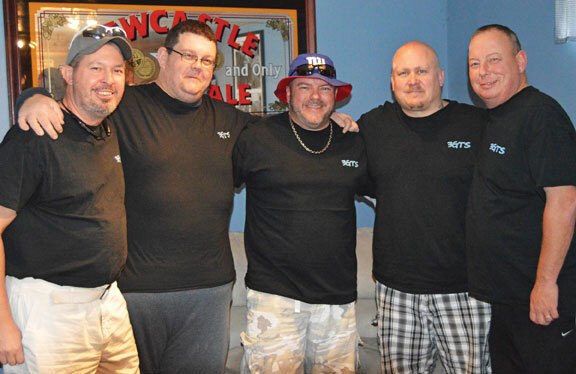 The episode was broadcast live from Wing It On Tap in Naugatuck. The three guys are also bringing in special guest speakers, including Naugatuck Hall of Fame member Fred Scheithe in September. Stay tuned as the trio is looking to bring in more Naugatuck sports figures to chat on the borough’s athletic legacy. “We have an open invitation to any Naugatuck coach who would like to come on and discuss their team or Naugatuck sports in general,” Granahan said.